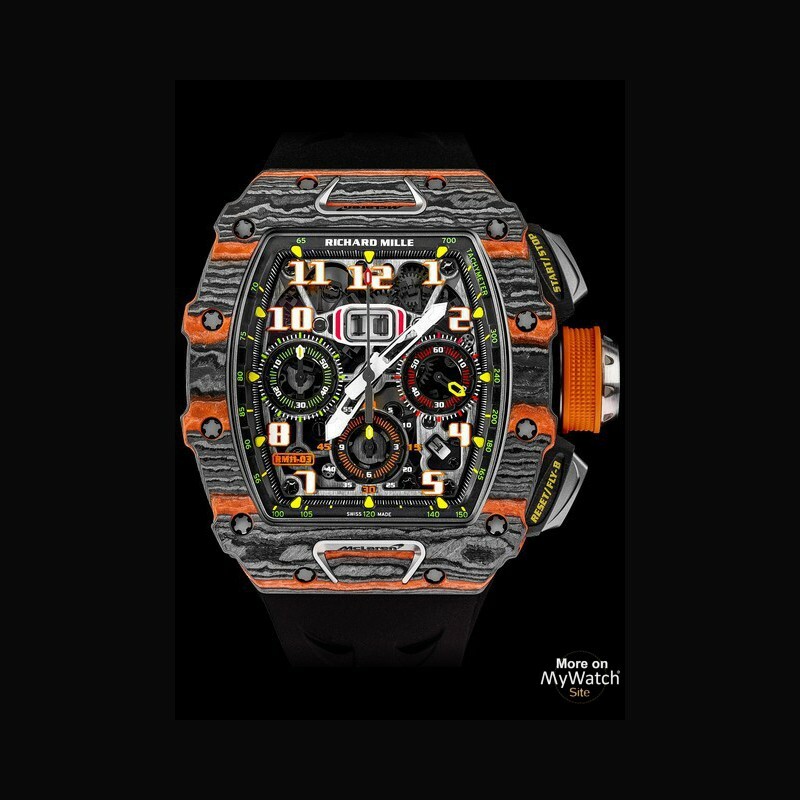 Price request for RM 11-03 Chronograph Flyback McLarenRef. Oversize date and month indicator. 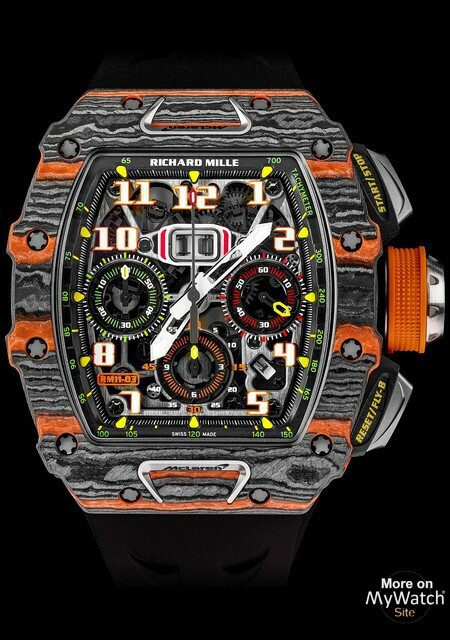 Richard Mille and McLaren Automotive have revealed their first jointly-commissioned timepiece, the RM 11-03 McLaren Automatic Flyback Chronograph, at the Geneva International Motor Show during a reception hosted by McLaren Automotive CEO, Mr Mike Flewitt and Richard Mille CEO, Mr Richard Mille.Limited to just 500 pieces globally and priced at 180,000CHF plus tax, the watch will be made available initially mainly to McLaren Ultimate Series clients. 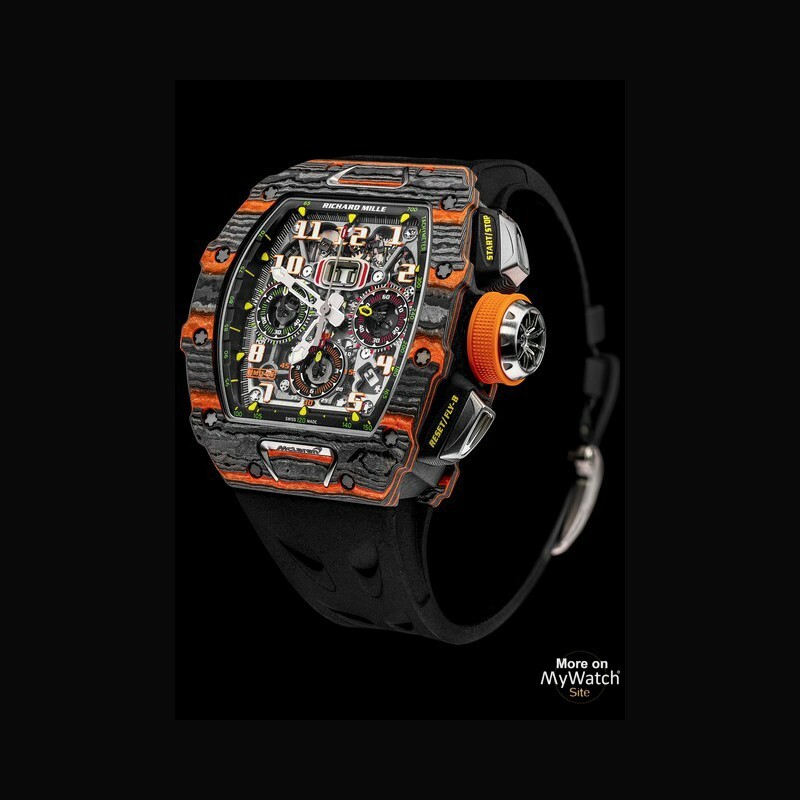 The RM 11-03 McLaren, created in close collaboration between McLaren Design Director Rob Melville and Richard Mille Engineer Fabrice Namura, has been in development since McLaren Automotive and Richard Mille partnered last year uniting a mutual interest in unique design, the use of new materials and modern craftsmanship. “ The idea was to take on a real technical challenge, and come up with something other than a mere dial with an inscription, for example. I find the 720S designed by Rob Melville mesmerising beautiful, and we wanted to give the RM 11 03 McLaren curves that were similarly both aesthetic and functional,” says Namura. 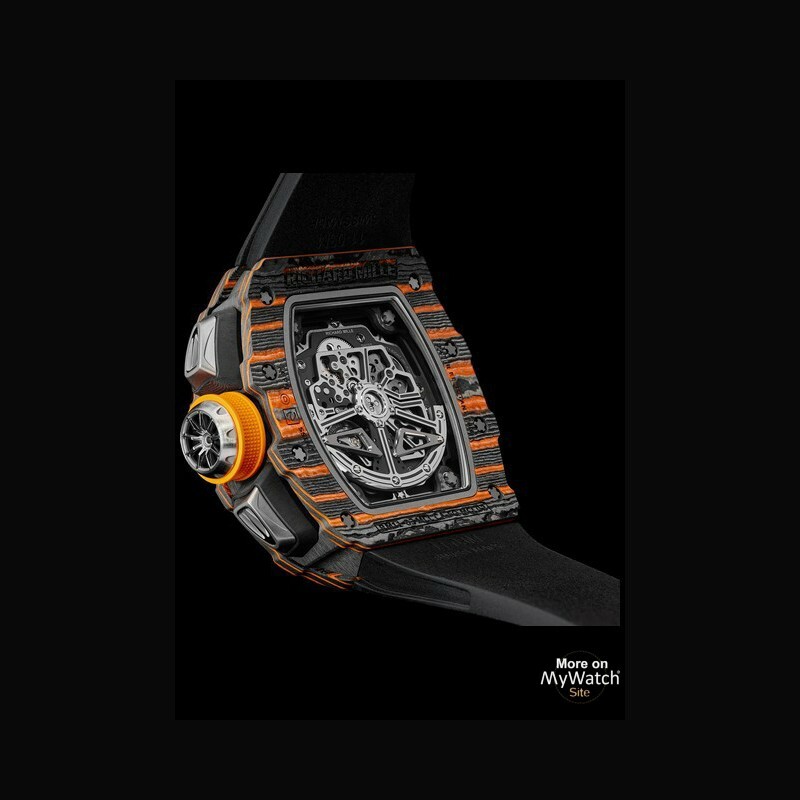 These influences, as well as design cues borrowed from McLaren’s range of luxury sports and super cars, are reflected in this special timepiece. 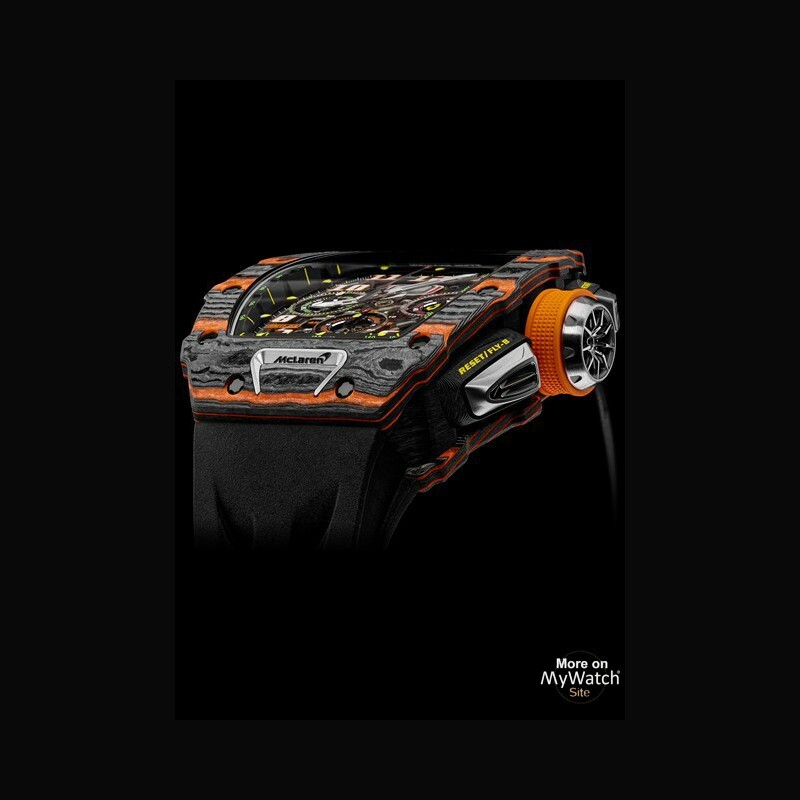 The case of the RM 11-03 McLaren is made of Carbon TPT® interlaced with Orange Quartz TPT®, resulting in an extremely resistant and light-weight case while paying tribute to a colour that is synonymous with McLaren. The Carbon TPT® enhances the mechanical performance of the RM 11-03 and offers resistance to harsh environments. The titanium pushers fitted to the Carbon TPT® case echo the design of the distinctive headlights of the McLaren 720S. 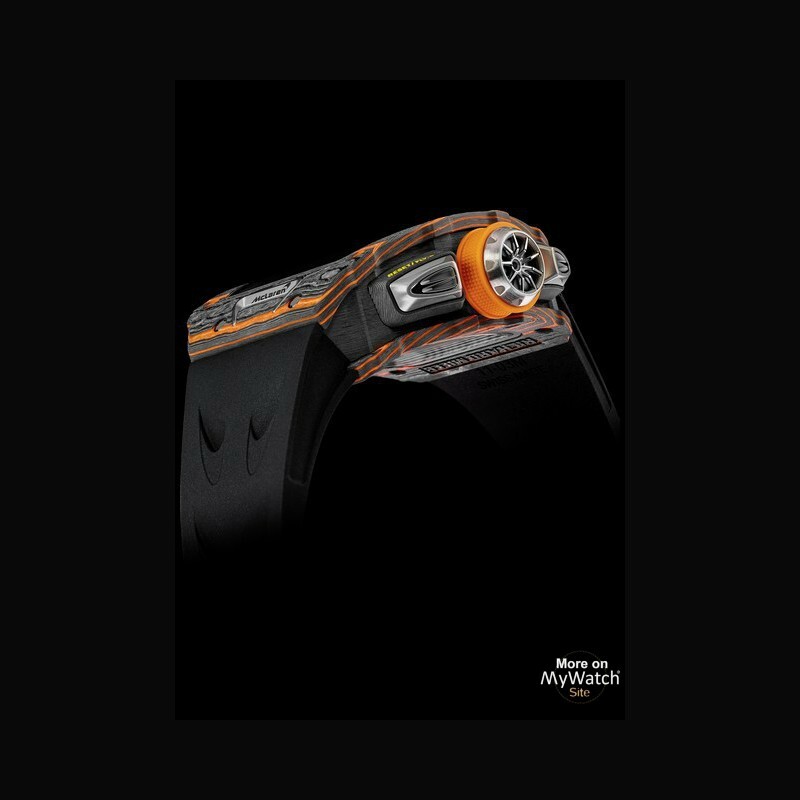 Titanium inserts, similar in shape to the iconic McLaren F1’s air intake snorkel and bearing the McLaren logo, adorn the bezel. 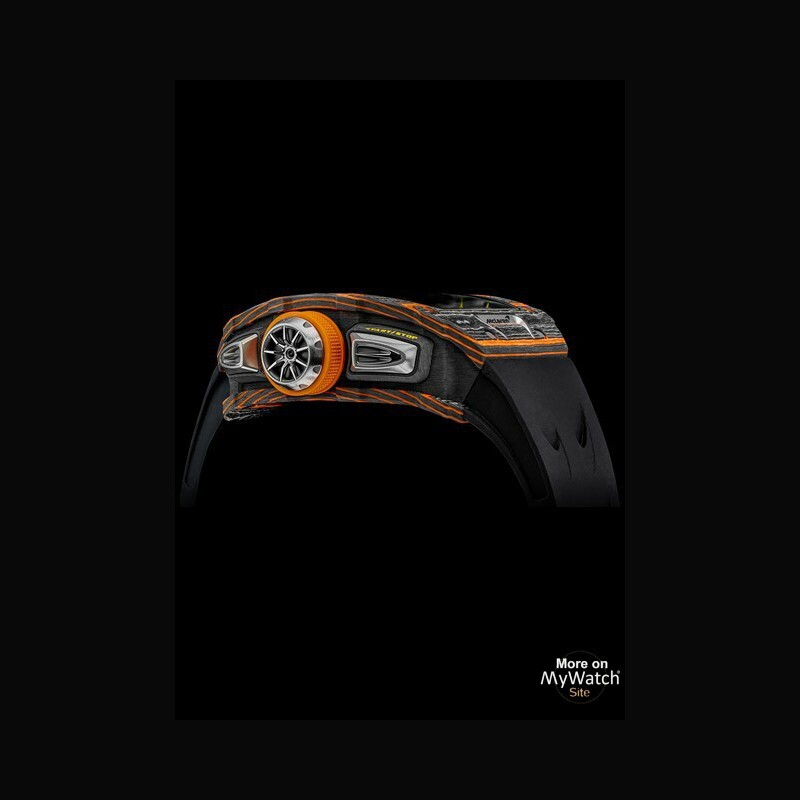 The complex grade 5 titanium crown is shaped like a McLaren lightweight wheel. 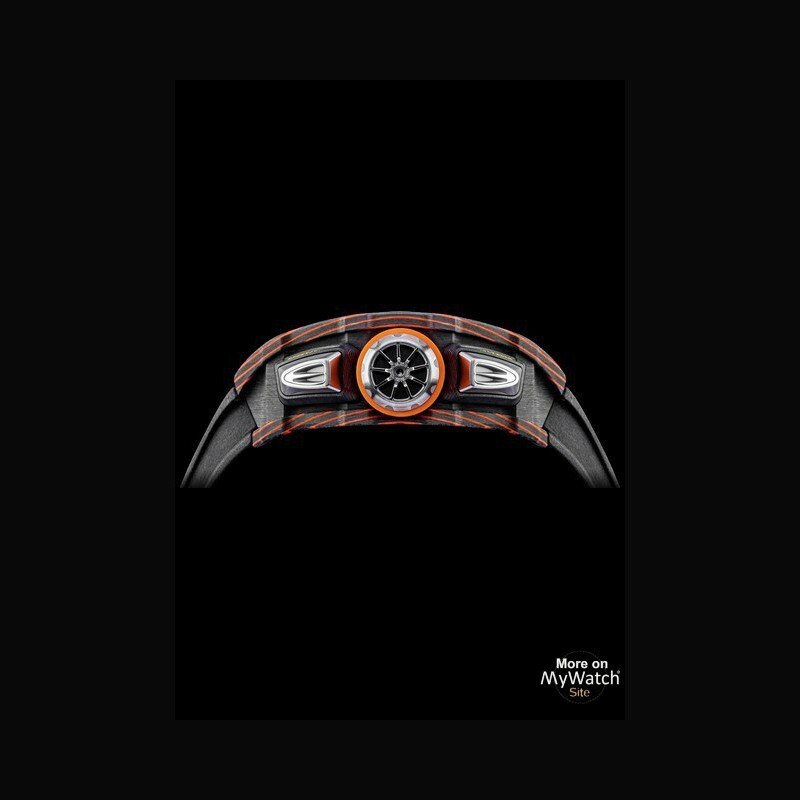 While the McLaren Speedmark logo is incorporated on the rubber strap specifically developed for this edition. 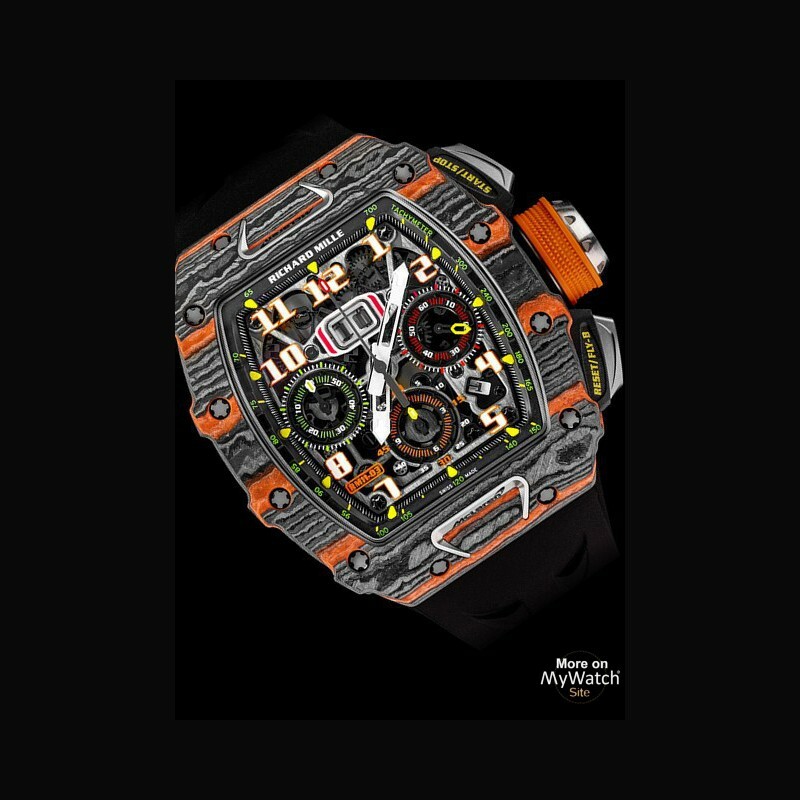 Under the bonnet of the RM 11-03 beats the automatic RMAC3 calibre, first launched in 2016, with a flyback chronograph ready to literally race on the track. The instant return of the counter to zero makes it possible to quickly restart the stopwatch function. 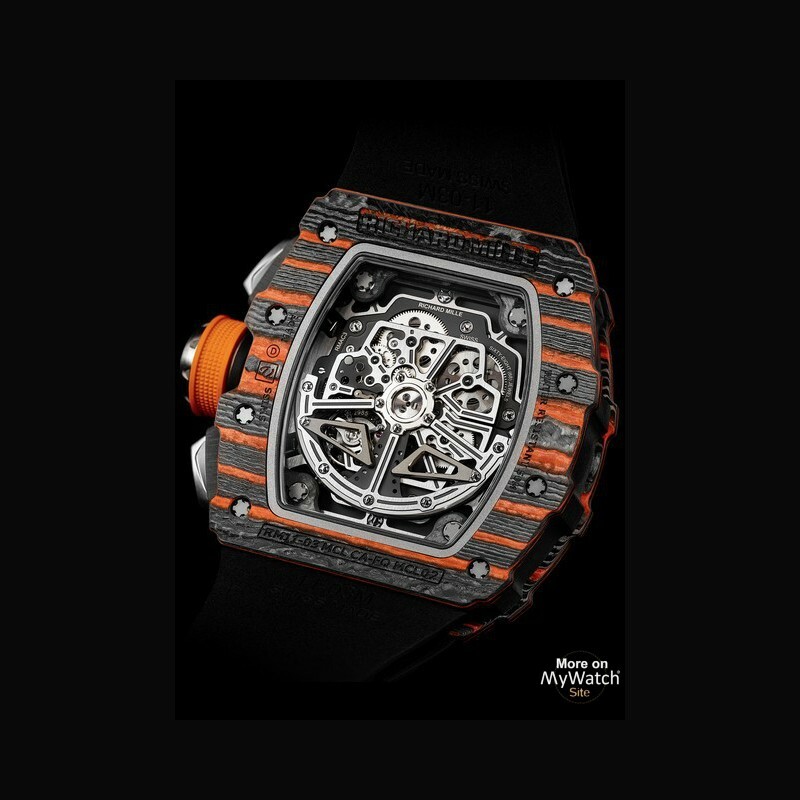 Powered by two barrels mounted in parallel and a balance wheel with variable inertia, the movement has a 55-hour power reserve. 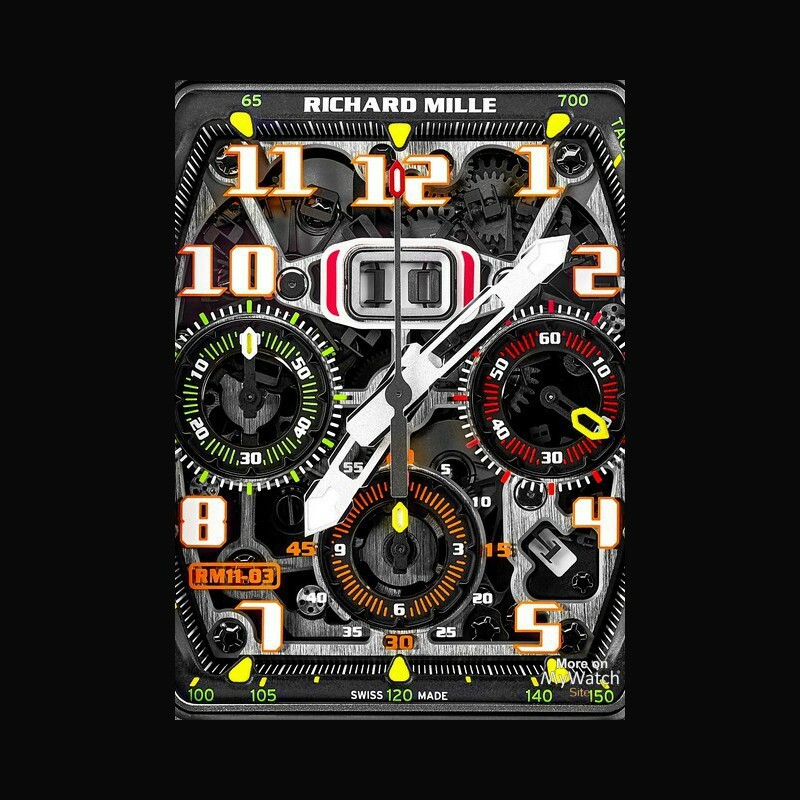 Barrel winding is ensured by a variablegeometry rotor that enables personalised winding adjusted to the wearer’s activity level, further evidence of Richard Mille’s characteristic attentiveness. The fact that a race car’s chassis must always exhibit tremendous torque resistance while remaining light in weight inspired the brand, which adopted these requirements as its own in producing the baseplate and bridges for this calibre of PVD-treated grade 5 titanium to ensure the requisite stiffness and perfect functioning of the going train. The satin-finish grade 5 titanium upper bridge further accentuates the depth of the calibre, creating a visual trajectory around the annual calendar and oversized date as well as the 12-hour chronograph and countdown counters. With such technical specifications, it comes as no surprise to find the new RM 11-03 McLaren previewed on their booth at the 2018 Geneva Motor Show. 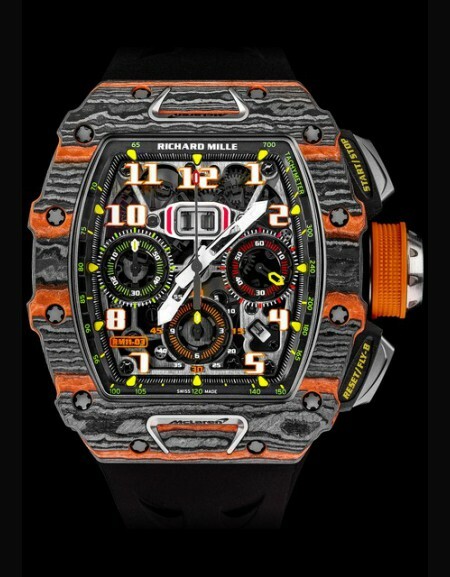 The RM 11-03 will be offered to McLaren Ultimate Series customers exclusively through Richard Mille Boutiques. 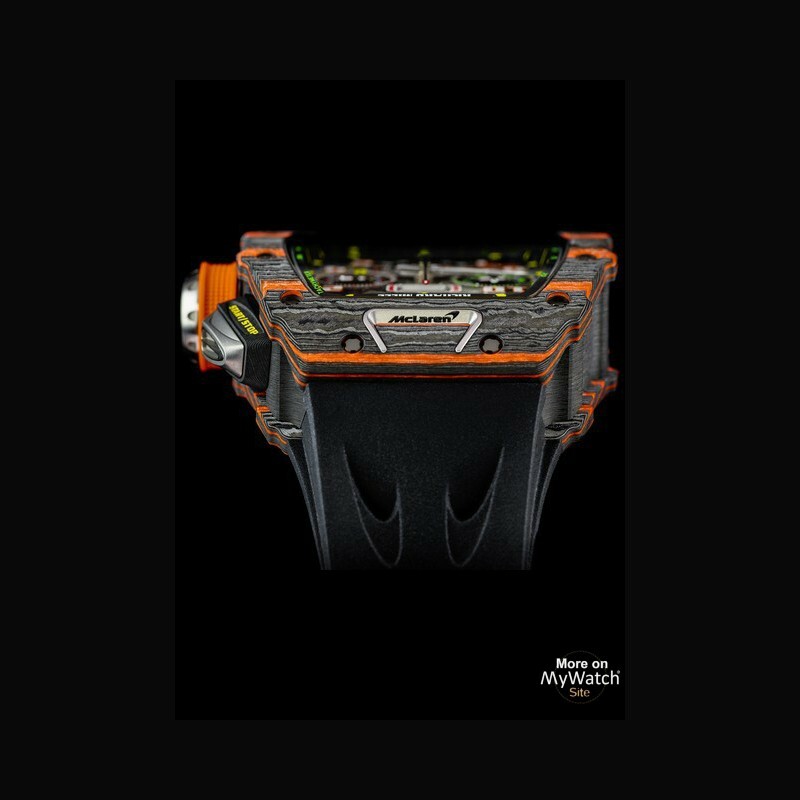 McLaren customers will have the opportunity to match their edition number of 1 to 500 of their McLaren Ultimate Series to the caseback number of their RM 11-03 McLaren.